Last year I participated in the first annual International Blogger Cookie Exchange hosted by Lori at Fake Food Free and Andrea of Food Embrace and loved it so much that I put my name in the hat to participate again. Instead of actually sending the cookies we make to each other, we send each other recipes to try at home and eat ourselves! I was delighted to find out that my recipe was coming from fellow Kentucky Food Blogger Tammi from Picture Perfect Cooking. 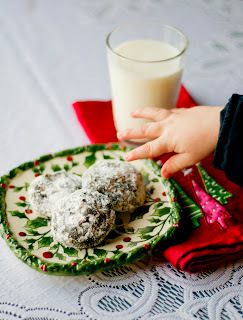 She sent me the recipe for Double Chocolate Snowball Cookies...and my entire family LOVED them! These are great cookies to make with kids--easy, but they get to get their hands dirty while rolling the dough around the chocolate chips. My daughter helped make these, but as you can see in the photo above, it was my son who tried to sneak a bite or two! I made the recipe as instructed for half of the batch. The second half, I divided into two parts and tried different fillings. I had a craving for caramel, so my original idea was to stuff a caramel into each cookie, but my daughter begged to create her own cookie...how could I say no?! I cut caramel squares into quarters and placed two quarters into each of my cookies. My daughter wanted to play with hers, so put one quarter of a caramel and two chocolate chips into hers. Her version won hands down! The all-caramel cookies leaked caramel all over the pan and came out flat, while hers looked just like the original version. My husband described my daughter's cookies as tasting just like a candy bar. I'll definitely be making this again and am excited to try out new fillings: miniature candy bars, peppermint chips...the possibilities are endless! Recipe Notes: This is the original version of the recipe, but feel free to play around with the fillings and possibly even the dough flavors. Try substituting other extracts for the vanilla and see what happens! In a large bowl, mix the butter, sugar and flour until light and fluffy. Stir in the flour, cocoa and nuts. Wrap the dough in plastic wrap and flatten into a disk. Chill for one hour. Preheat oven to 350 degrees F. Place a sheet of parchment paper on a cookie sheet. Unwrap the dough and cut it into about 24 even pieces. Flatten each piece into a circle and place three chocolate chips into the middle. Shape into a ball, tucking the chocolate chips inside. Place on the parchment paper and bake for 18-20 minutes. Remove from the oven and let the cookies cool for about 5 minutes on the sheet or until you can remove the cookies to a cooking rack without them falling apart. Once they've cooled a little more, roll in powdered sugar. So glad y'all enjoyed the cookies! I am making a batch this week and I think I will try your daughter's version. Caramel in the middle is a great idea. 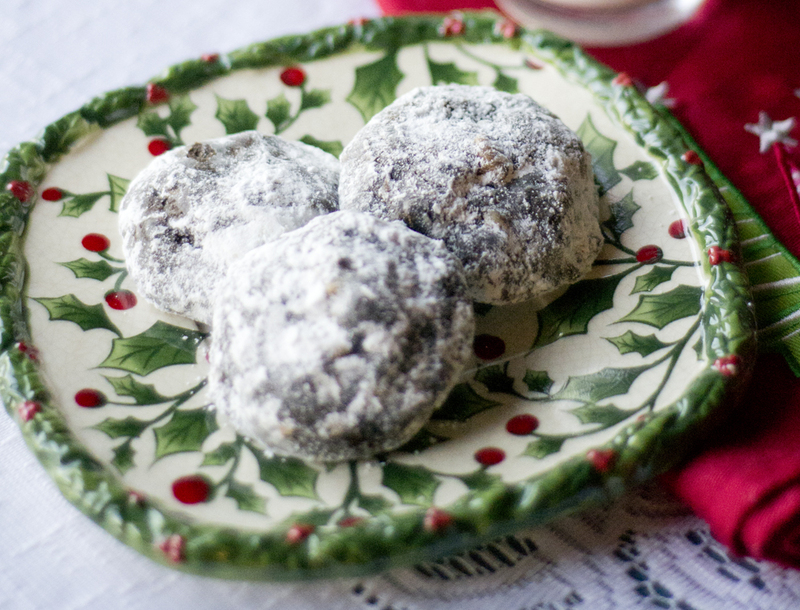 Your blog post Double Chocolate Snowball Cookies [International Blogger Cookie Exchange is excellent Actually, i have seen your post and That was very educational and very entertaining for me. gratitude for blog posting Really Such Things. I should suggest your site to my friends. "Do not ask me to go sit?" kobe 10 elite Low sip of wine, Duzhe door subside after half a step, hook a hook mouth smile is not so obvious: "I just ask aunt clean the house, do not want to dirty the door, at the door to say something." FUJIAN SCHOOL face a white. "OK, then I'll say, anyway, Cheap Kobe 9 Elite do not come to you to renew old friendships." FUJIAN SCHOOL deep breath, Yan Liang very few people see her so embarrassed look, listen to her and said: "Are you in the end with Zhou Cheng said what he actually went to dad there to intercede for you, you know dad were originally going to let you go under branches to change to change the temper and then transferred back. " KD 8 Shoes this time will really laugh again: "? Xu Goddess how careful their position can not be maintained?" kobe elite 9 coldly look at her, walked Niutou Zhao ward. FUJIAN SCHOOL remain in place,kobe 9 elites shrugged helplessly away toward the periphery. Before the moving companies start moving your items, ensure that you remove the area for smooth moving. Our Indian escorts in Dubai who gives you sexual pleasures fascinatingly are available 24 hours. we have lots of for you to read more about Indian Call Girl in Dubai.